With the near-completion of the chassis now out of the way, we decided to turn our attention to the body. 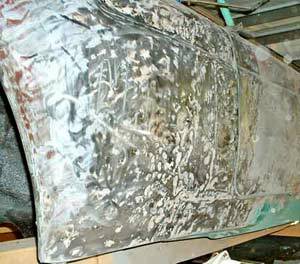 As mentioned earlier, the entire car had been coated with a way-too-thick layer of Bondo, especially on the lower area of the body. That stuff had to be removed for two reasons: we needed to know the condition of the metal underneath, and second; more than a 1/4 -inch thickness of filler will eventually crack off and ruin the final paint job. 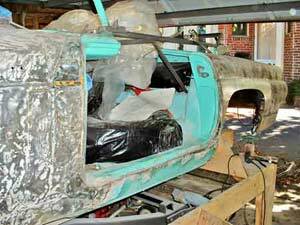 The "nose" had been scrunched at one time and deep dents had been filled with plastic. 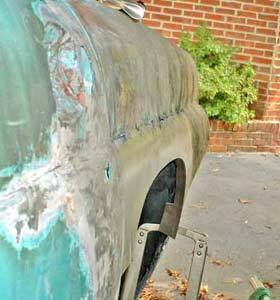 The left front fender had been hit at the door seam and a sloppy job at dent straightening had been done way, way in the past. 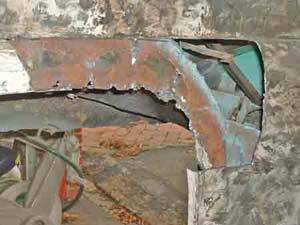 The driver's door wasn't bad, but the rear fender from there, over the wheel and down to the lower quarter had been repaired with new sheet metal that was flat (no attempt at body curvature had been made.) The body contours were created with thick filler, often as much as 3/4 inch, and the "record" was 1 inch in a small area over the left rear wheel. The same thing was the case with the right rear fender, so we ordered new panels for both sides. The right front fender was in very good shape but the door had been badly repaired, again with a flat piece of metal at the bottom and then it was shaped with filler. 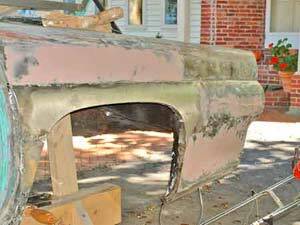 The bottom of the body was in pretty good shape and still covered with the thick layer of undercoating applied to it in 1955. It could be pressure-washed off, we reasoned, and preparations were made to do so on the first nice day that came up. When that occurred we cranked up the washer and blasted away, removing about 95% of the old undercoating. It's rolled outside, ready for the pressure washer. That doesn't look too bad, does it? That left only a few square feet of undercoating to be scraped off, after which we planned to wire-brush the metal surface and then prep and recoat with spray undercoating. Why the undercoating rather than paint, you ask? 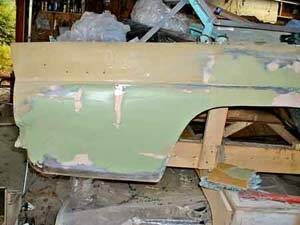 Well, the original paint was adhering quite well to the body and the metal was in good shape, so why not undercoat it? 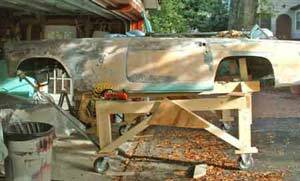 Besides, the T-Bird isn't a monocoque body, so it doesn't rely on perfect metal structure for rigidity. The frame does that, so we figured we'd take advantage of the sound-deadening properties of undercoating. 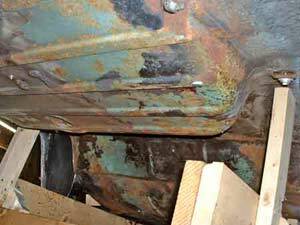 New rear panels arrived, so we started the [careful] cutting out of the old, flat piece of metal over the wheel well. 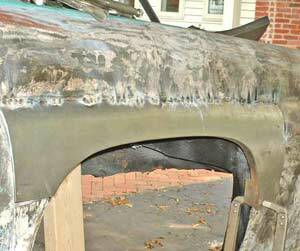 Peeling back some of the panel, we saw original inner fender metal in what appeared to be rusted-out condition. Going further with the cutter we removed the whole over-wheel section, revealing what was left of the original inner fender material and new metal that had been welded in to replace it at some time in the past. The air cutter makes a clean cut. The arrow at the left points to the flat contour of the panel, and the arrow on the right shows a hideous weld and pushed-in panel. It turned out not to be the catastrophe we thought it might be. Upon close inspection we found the new metal inner fender panel was very thick and strong, with just surface rust on the upper (invisible) side. 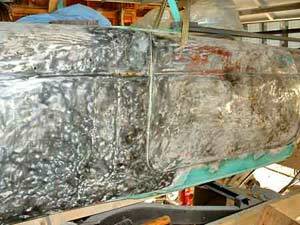 Once we peeled back the original inner panel's "swiss cheese" structure, what was left was a solid - if ugly - repair that we could weld our new outer panel to. 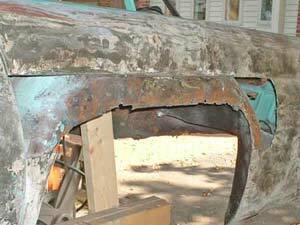 With the rust peeled away, this metal only needs to be cleaned up and coated against rust. We cleaned everything up and did the necessary trimming and prepping of the inner fender panel, then made our measurements for fitting the new outer panel. After about an hour of fitting, fussing, trimming and making sure of everything, we clamped the piece in place for welding. It's beginning to look like the original car. We tack-welded the panel, jumping from one end to the other to minimize warpage. Taking our time, we managed to keep everything straight during the welding process. Ugly, but tacked in place. Always look from every angle to make sure the panels are lining up with the rest of the body. The welding is nearly finished and ground down to see where more is needed. Note the little extra panel welded at the lower left. Our replacement panel didn't extend far enough for our purposes. 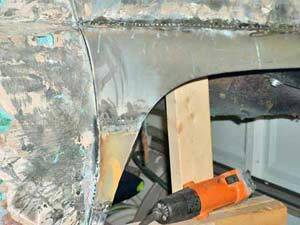 Once the wheel well panel was in place we turned our attention to the lower rear panel. 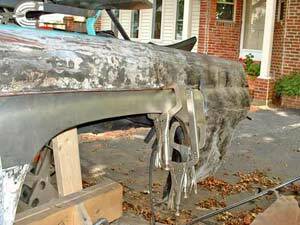 The piece originally welded in was not only concave, but also 1 1/2 inch short and not shaped correctly at the rear where it meets the bumper. We cut it out and fitted in a new piece, taking care with the welding not to create more problems. After about an hour the new piece was in and the rear was looking like it should. At least the overall shape is very close to original, but lots of grinding and dent-pulling and light filling will be required. We were tired of welding at this point, so we turned our attention to the left front fender where it meets the door. After removing what seemed to be a metric ton of filler we viewed the original metal. 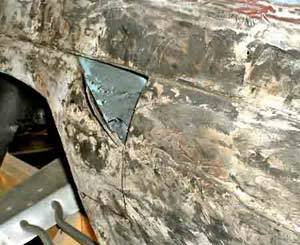 The car had clearly been hit in the area forward of the door at some time in the distant past, and some mechanic had pounded the bulk of the dents toward the surface, welded in a small plate and then troweled on the Bondo. Don't bother to count the dents, there are 143 of them! The seam at the door opening was a mess of bent metal, so we considered replacing that part of the fender. 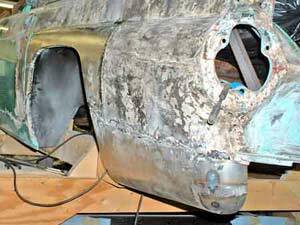 However, fenders on T-Birds were part of the welded body structure and not removable. Patch panels for the affected area exist, but are expensive and made of relatively thin metal. We thought it over and decided to make some patches ourselves to cover the three (small, but major) areas of concern. We removed the door and shaped and welded our patch pieces in, trying to keep the overall shape correct. Granted, replacing the entire rear fender panel would have been a more elegant solution, but the metal structure was in very solid condition and we wanted to continue the momentum instead of waiting for parts. The whole thing is beginning to look a little "Frankenstein-ish," but it will certainly be strong! You might be asking how we pulled out all those dents. Well, where we could get behind them in the inner fender we pounded them out with body hammers. Where we couldn't get to them we drilled a 1/8th inch hole in the center of the dent and then screwed in a sheet metal screw. Judicious leverage with a claw hammer pulled them out quite nicely. 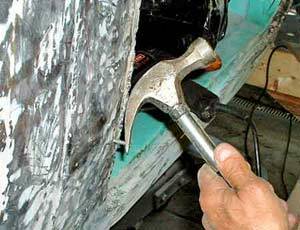 Make sure you lever the hammer against something that won't bend, or you'll create another dent. After the better part of a day spent shaping, pulling, grinding and welding (all those drilled holes needed to be welded closed) we stepped back to admire the finished work. It looked reasonably straight, so we got out the filler can and started mixing. 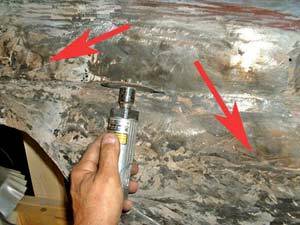 We spread filler over our [cleaned] welded area to bring the surface up to that of the plane of the door, using as thin a coat as possible. 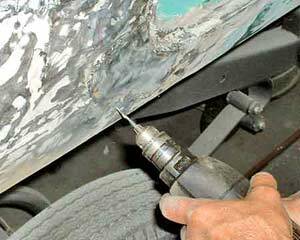 We then did the same to the repaired areas at the back fender. It's hard to see, but the fender is pretty straight now. A light coat on the welded areas, and then some sanding. The rear end, after two coats of filler with intermediate sanding. Note that we used two different colors of hardener. This makes seeing where you're going much easier.